As days get sunnier and the temperatures warmer, giving in to your natural urge for the great outdoors is better for your health and happiness than you might realize. Savoring sunny days and fresh air by gathering around the grill or lounging on the porch can actually improve your blood pressure and energy level, elevate your mood and improve mental concentration, experts say. Creating an outdoor living room has never been so popular or so full of possibilities, thanks to the abundance of outdoor furnishings and accessories available now– from seating to tables and rugs, pillows and lighting. Forget the mundane lawn chair or plain picnic table of the past. Today’s outdoor living rooms are cozy, comfortable and oh-so stylish. According the American Home Furnishings Alliance (AHFA), nearly 85% of households plan to add outdoor furniture in 2015. The number one item on the shopping list is an outdoor chair, followed closely by a fire pit. In fact, the American Society of Landscape Architects named fire pits as the number one outdoor design element in demand for this year. Ultimately, the key essential for outdoor living room comfort is seating. While rocking chairs lined in a row on the front porch may still have their merits, today’s outdoor living room seating arrangements span the gamut from upholstered sectionals to the classic Adirondack chair made into a lounge chair version. According to the AHFA, traditional is the number one outdoor furniture style, followed by contemporary/modern, “natural” and “rustic.” Thanks in part to more durable outdoor fabrics with more resistance to soil and water, today’s outdoor spaces are often just as stylish as inside the home. Outdoor furnishings are created with comfort in mind to encourage relaxing and enjoying all the benefits of outdoor living—better health and happiness among them! Believe it or not, the mattress has been around for almost 10,000 years. Maybe not the luxurious mattresses we know today, but a form of mattress was first invented in during the caveman period. These mattresses were mostly made of natural items – straw, leafs, grass covered with animal skin. Comfy, right? The Persians were the ones to really innovate and improve upon the mattress and sleeping conditions. Persian royalty slept on the first water beds – goatskin filled with water. Ancient Egyptian Pharaohs raised the mattress off the ground by using pallets. King Tut had a bed base made from ebony and gold; while prettier, it was not any more comfortable than sleeping on the ground. Want to learn more about how people have slept through the ages? Many museums have some examples of bedroom furniture (though some of it more closely resembles torture devices) throughout history. The Metropolitan Museum of Art in New York City has a collection of bedroom furniture, as well as design drawings of bed designs from all over the world and throughout history. The Frick Collection, also in New York City, has examples French, Italian, and English furniture of the Renaissance to the nineteenth century. Perhaps the best places to see examples of beds is to visit historical home museums. The Palace of Versailles is an amazing example of ornate – and let’s be honest, over-the-top opulent – 17th century bedding. Some of the beds are literally made of gold! The White House is an excellent example of Victorian era bedding. The Lincoln Bedroom is most likely the best known room in the House, aside from the Oval Office. Although, Lincoln never actually slept there, the bedroom is said to be haunted by none other than President Lincoln himself and used as a guest bedroom for distinguished guests of the President and First Lady. Ever flipped through a home magazine and marveled at how perfect everything looks? While those professionally decorated rooms may seem unattainable, the difference between where-did-I-go-wrong and “wow” is often only a matter of inches. That’s because professional designers know the measuring rules that ensure aesthetically pleasing results. Let’s go to the (measuring) tape! Paint: Before having your favorite color mixed, measure the length and width of your walls to determine how many square feet you need to cover. As a rule, one gallon of good quality pain will cover approximately 400 square feet of wall space. Before beginning, it’s always a good idea to paint a test swath to see how the color you think will look simply divine appears in different lights throughout the day. Lighting: Strategic overhead lighting can greatly enhance a space if you’re smart about fixture size. To determine the best size for your space, add the length and width of your room in feet to find the size (in inches) of an appropriate fixture. For example, if you room is 15 by 20 feet, look for a chandelier that’s about 35 inches (15+20) wide. Keep in mind that if you’re hanging a chandelier over the dining room table, the bottom of the fixture should end 36 inches above the table. Windows: In-the-know designers use curtain fullness and spacing to make windows appear larger. As a general rule, curtain panels should be two-and-a-half to three times the width of a window—making each panel one-and-a-quarter toone-and-a-half times wider. Another way to make a window look wider is purchase a curtain rod that is 20 inches wider than the window, then extend the rod ten inches on each side. To create an illusion of height, mount curtain rods as high as possible above the window while letting the curtain panel just touch the floor or fall below it with up to a one-and-a-half break on the floor. Dining Tables and Chairs: Ever wondered just how many chairs should be placed around your dining table? Here are the guidelines for ideal seating arrangements: Use two to four chairs for 36-inch wide tables, six chairs for 48-inch rounds, and eight armchairs or 10 armless chairs for 60-inch rounds. chairs, you’ll need to estimate how much fabric you’ll need, and it’s often a lot more than you might guess. For example, a standard 84-inch sofa with exposed legs and a tight back will require 14 yards of plain, 54-inch wide fabric. For a skirt, add an additional two yards, and if the fabric you love has a pattern or repeat, expect to need an additional one-and-a-half to two times more fabric. To cover a wing or club chair, you’ll need from five to seven yards of fabric, depending on pattern and repeat. Hint: Unless you know your older sofa is of high-quality, using eight-way, hand-tied construction, it’s often less expensive to buy new than recover! Now that you’ve got the inside scoop from the pros, your space is sure to be magazine-shoot ready in no time! From the fashion runways of Paris, New York, and Milan to the cover of Pottery Barn, the deeper mid- tones of blue have never been more popular. Perennially popular blue/white combinations are being softened and made new again with the infusion of grey/cream under tones and blue hues that are on the decidedly darker and richer side of their color spectrum. Gone are the harsh bright white/navy combinations. They feel all too hard edged and modern. Instead the considerably softer combinations of cream or pearl or salt / indigo or lapis or royal all are right on-trend with a more contemporary and relaxed aesthetic. Interior designers like Ralph Lauren and Barclay Butera have for several seasons now embraced this classic design approach. Helping to drive this renewed interest in blue/white combinations are multiple Asian referenced design themes which are prevalent in home design as well as at the highest levels of haute couture. Japanese tie-dyed and shibori designs and motifs have never been more popular and feature the many shades of their artisanal denims. The Metropolitan Museum in New York, has recently extended twice their exhibition of “China Through the Looking Glass” as hordes of devoted fashionistas and design devotees have flocked from around the world to see this exhibit. Included in the exhibit is a whole section on the influence of the famous blue/white Willow Ware, and how it has been translated into almost an endless range of fashions and home accessories. Textile collections from major mills all jumped on these restful patterns and color combinations in their latest exhibits at the international Showtime market this past July .The influence of the hill tribe Hmong peoples from the boarder territories between Vietnam and China are especially current also, as their cultural patterns and color combinations of indigo touched with ruby, dominate textile and jewelry design. So put away those stone washed jeans and splurge on a new pair of indigo dungarees. Team them with an ox blood chambray shirt and you’ll be right in fashion! In your home we like to compliment these cobalt/snow combinations with a single strong tertiary color. As mentioned above, using ox blood or ruby is one approach to an updated red-white-blue combination. But to our eye a bright yellow, or glamorous malachite makes an even more modern and on-trend combination. Keep your metal accents in soft pewter or nickel tones and you’ll have a room that’s timeless, energetic, and easy to take either more or less casual depending on how you complete the accessories and complementing case pieces. Looking to create an inviting setting for this fall’s seasonal celebrations and Thanksgiving gatherings? Look no further than your backyard, nearby woodland trail or the local farmer’s market. This fall, the home fashion look is natural elegance. “Fall’s fashion lineup weaves earthy neutrals with a range of bold color statements and patterns to reflect a landscape of hope, fun, fantasy and all things natural,” said the Pantone Color Institute. Earthy elegance is on-trend. “Fall and Winter 2015 colors are evocative of a love for nature and a timeless appreciation for warmth and security,” added the Pantone Institute. “I love to decorate with nature by mixing subtle greens, blues and golden yellows with pink roses and soft white pumpkins,” said top design blogger Courtney of French Country Cottage. As you set a welcoming seasonal scene with rustic, organic and textural elements, your furnishings can add to the charm when you select natural and reclaimed-looking woods with wire-brushed finishes that show the beauty of the grain and are easy to live with. 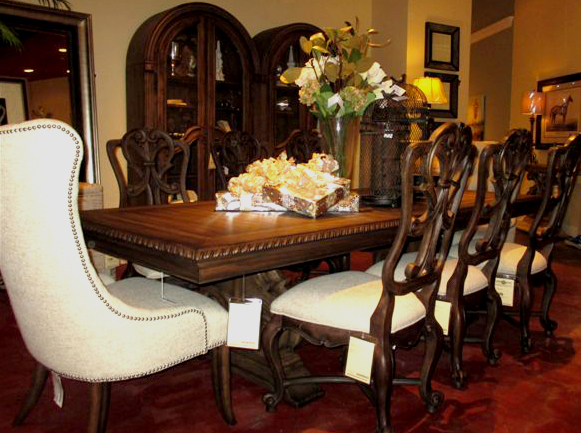 Dining and other wood furniture with open grain looks are livable and authentic. An added bonus: they are carefree, with little worries about scratches, dents or spills. As part of the appreciation of all things natural and organic, “live-edge” furnishings and wood décor have gained great popularity as well. Essentially, these furnishings are made from a slab cut out of a tree. The sides of a dining table, for instance, look just like whatever the tree looked like when it was harvested—sometimes the bark is left on, sometimes not. The edge has the same kind of look that Mother Nature gave it. However you bring the beauty of nature to your home for this fall’s celebrations, the most important part of being thankful together is good company and a warm and inviting home. Enjoy it all with another of nature’s great gifts: the pumpkin. Enjoy this recipe for Pumpkin Bars, a fresh twist on the classic pumpkin pie. Preheat oven to 350 degrees F. Line a 15x10x1-inch baking pan with foil, extending foil over edges of pan; set aside. In a medium bowl stir together flour, baking powder, cinnamon, baking soda, and salt; set aside. In a large bowl stir together eggs, pumpkin, sugar, and oil. Stir in flour mixture until combined. Spread batter evenly in the prepared baking pan. Bake for 25 to 30 minutes or until a toothpick inserted in the center comes out clean. Cool in pan on a wire rack. Spread with Cream Cheese If desired, sprinkle with chopped walnuts. Using edges of foil, lift uncut bars out of pan. Cut into bars. Many of them have design backgrounds and have been here for years. The store is so large that they have to invest in the best shoes (always black!) and some even have a pedometer. One sales team member recorded 15 miles in a single 8 hour period!! That’s a LOT of walking. To be successful at this position, you have to love it! 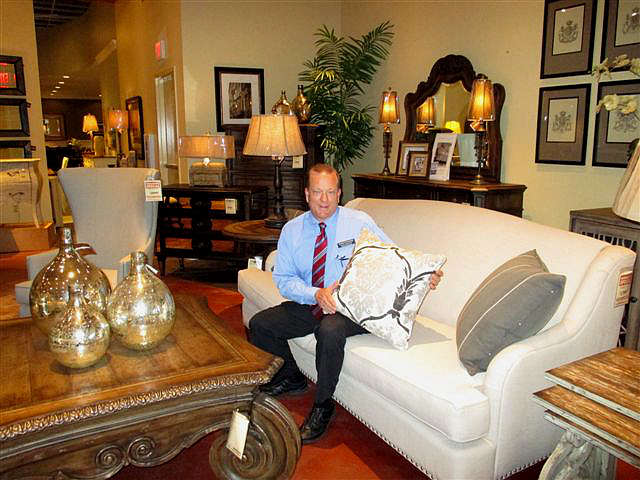 I talked to Rob Rawheiser, who has worked in furniture for 35 years. (Talk about design trends Rob has seen!) He has many clients that return time after time just so they can see him. (How cool is that?) He has helped a lot of people but one of his favorite stories is about a client who kept his business card for 14 years (wow) and sought him out to furnish a new house 14 years after they first worked together! Another team member we are introducing for the first time is Paul Cell. Being an artist certainly helps Paul work with his clients here at Johnny Janosik. He is a self-taught painter using mostly oils capturing the beautiful landscape scenes of the eastern shore. He said that this lets him see colors and designs that naturally work well together. In fact, word of mouth has sold many of his landscapes, lighthouse, and seascapes paintings. Our Dover, DE store has many gems as well. Take David Brown, he has over 28 years in the design field and has even taught interior design at Delaware Community College. (That’s commitment to design) He brings a wealth of knowledge that is hard to find and if you are ever in the Dover he invites you to stop by and chat! We hope you get to know us through this blog so we will share something interesting from a sales consultant each week. We are planning some things I think you will like for design inspiration (hint: think house tour) in upcoming blogs. Thanksgiving is soon-is your dining table big enough for all that turkey??? If not I know where you can buy a beautiful dining group- just saying! !